Includes Blooper Reel, Meet Bonzo the Zombie Clown and more! CULVER CITY, Calif. (Aug. 17, 2015) – The worldwide video game phenomenon Dead Rising comes to life in the action-packed zombie thriller DEAD RISING: WATCHTOWER, available on DVD and Digital HD October 6, 2015, from Sony Pictures Home Entertainment. Jesse Metcalfe (TV’s “Dallas,” “Desperate Housewives”), Meghan Ory (TV’s “Once Upon a Time,” “Intelligence”), Virginia Madsen (TV’s “Witches of East End,” Sideways), Dennis Haysbert (TV’s “24,” Sniper: Reloaded) and Rob Riggle (21 Jump Street series, The Hangover) star in this terrifyingly fun movie that follows reporter Chase Carter and a group of survivors who become trapped in a walled-in quarantine area after the government fails to contain a viral zombie outbreak. Creatively building weapons with anything they can find, the team must evade infection and battle their way out of the quarantined zone before it gets firebombed. Arriving just in time for the Halloween season, this must-own DVD comes loaded with awesome bonus features, including the making-of featurettes “The Weapons of Dead Rising: Watchtower,” “Genesis of Bonzo the Zombie Clown,” and “A Behind-the-Scenes Look at an Epic One-Take Shot”; Rob Riggle Blooper Reel and filmmaker commentary! Synopsis: Based on the videogame created by Capcom. When a mandatory government vaccine fails and a full-scale zombie epidemic ensues, a news reporter and three other survivors are trapped inside a quarantine zone. The team must use everything they can find to fight off the flesh-hungry mob and evade becoming part of the undead horde. 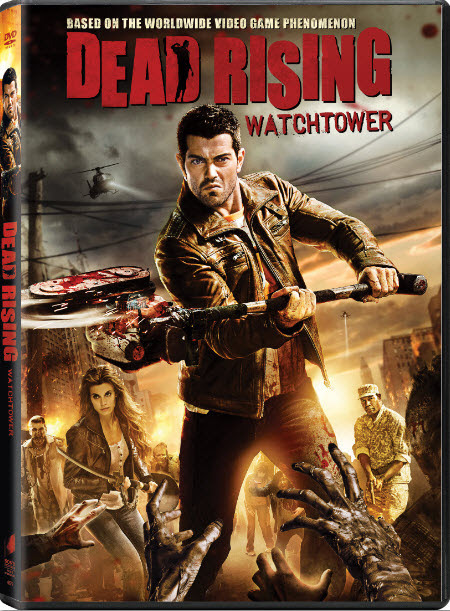 DEAD RISING: WATCHTOWER was directed by Zach Lipovsky (Leprechaun: Origins) and written by Tim Carter (The Chateau Meroux), based on the videogame created by Capcom. It was produced by Tim Carter. Executive producers are Tomas Harlan (The Chateau Meroux), Lorenzo di Bonaventura (Transformers series), Haruhiro Tsujimoto (Resident Evil: Damnation), and Kiichiro Urata. It has a run time of approximately 118 minutes and is not rated.